In 2018, the school selected Ms. Channpisey Vibol as the recipient of the PATA Foundation’s scholarship. Miss Channpisey was born on the 8th March 1998 in Ou Gno, Phnum Tauch, Mungkul B in Siem Reap province. Her parents are farmers. She has 4 siblings. Before coming to Sala Bai, she lived with her grandmother. 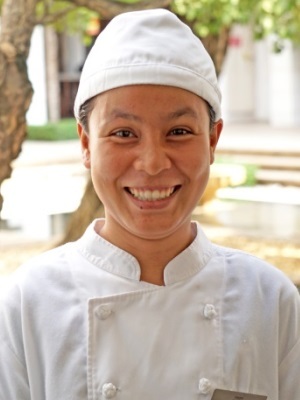 Channpisey did her fist internship at Park Hyatt Siem Reap where she was trained in the main kitchen. She really like working in the bakery / pastry department. Channpisey was selected as the student of the month in December 2017 by the other Sala Baï students. She was the number one of her department with a average of 18.22 / 20. After her internship at Park Hyatt Hotel in downtown Siem Reap, Channpisey came back to study at Sala Baï school on 2nd of January. The group she belongs to spends 8 weeks at school until 28th February. The term 2 of Sala Baï’s program is the time for apprenticeship in real conditions. All the students have completed alternatively 8 weeks in the industry in 17 different hotel partners and 8 weeks at school in both Sala Baï training hotel and restaurant facilities with a mix of theory and practice. Channpisey came back at Park Hyatt for her second internship. While the first time she developed her skills in pastry and bakery, this time she was able to rotate among the various kitchen departments and has been supervised directly by the chef party. Sala Baï students have to make a presentation in English by group of two every morning when all the students are gathering for the flag ceremony. For Channpisey, it has been the opportunity to get more confident by sharing in front of her friends one of her favorite recipe: the Poha Rice Salad. Watch the video to relive this moment.